The written submissions for the first round should be delivered to SCMS-NOIDA through post or through e-mail, by 1st September, 2015. Best 3 essays will be selected from each school after the first round. The selected participants will be invited for the final round wherein they will have to write essays on a topic provided at the time of the competition. 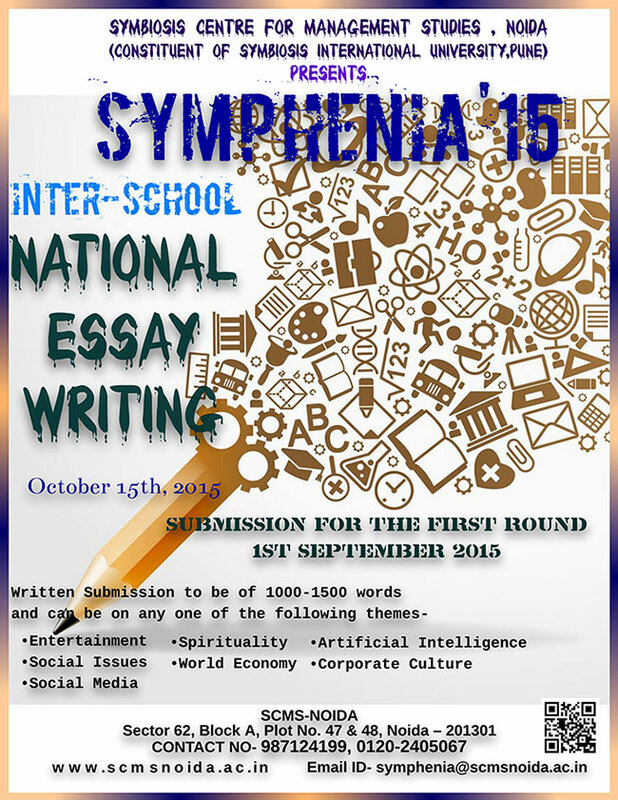 The final round will be held in our Inter-School Fest ‘Symphenia’ on 15th October 2015 and the results will be declared on the second day of the fest, i.e. 16th October, 2015. The essay should be written in UK English. Only original essays will be considered for the competition. Previously published essays are excluded. Any form of plagiarism will result in disqualification of the essay. Length of essay should be 1000-1500 words including footnotes. There should be a cover page including name of the Participant, Address, E-mail ID, Contact Number, Name of the School with address and email id. If the submission is made through e-mail, the subject line of the e-mail should be “Submission for Essay Writing Competition”. SCMS-NOIDA will honour all the winners (I, II and III) with Trophies. All participants will be awarded a certificate of participation.